According to Wikipedia, my trusted source for all things factual, comfort foods are remarkably easy to categorize. While a few things like the question of nature vs. nurture continue to confound the experts (as in, are we born with a taste for these foods or do we develop them through exposure? ), their basic characteristics are hard to dispute: they’re nearly always high-calorie, high-carb treats that deliver an opiate-like feeling of fulfilment, and they’re more often than not things we’ve been eating for many, many years. My own list of comfort foods is probably not that different from your average urban American of similar age (containing the expected brownies and cookies and pie as well as a few Mexican and Italian favorites thrown in for good measure), but one item stands out for never having made it onto my plate until I was well past those comfort-food formative years. I don’t know whether it’s a preference left over from a past life or simply an anomaly in my brain-to-palate wiring, but however you explain it, no top-ten list of my favorites would be complete without those marvellously crunchy, spicy, addictive gobs of pleasure from India called pakoras. I actually can’t remember the first time I tasted pakoras, but chances are high that they were quite literally my first taste of Indian food, since try as I might I can’t remember an Indian meal that didn’t start out with a plate of them, piping hot from the fryer. Pakoras (also known sometimes as bhajis, particularly in the U.K.) are found in many forms throughout India, and can be as simple as a piece of vegetable, fish, meat or cheese dipped in a thin chickpea batter and fried, or can be elaborate affairs of assorted vegetables, fresh herbs and spices. Although I most certainly wouldn’t turn down any kind of pakora, the latter are unquestionably my favorite since they take so well to a bit of tinkering and improvisation. And what’s most amazing is that in all honestly, despite the fact that I’ve had my share of bad-to-mediocre Indian meals, I can’t remember ever tasting a bad pakora. My favorite story concerning pakoras, however, is one that I was only peripherally involved in myself. It took place about ten years ago, when my roommate and I decided to host a Thanksgiving dinner in our small apartment in New Orleans. We were feeling sorry for ourselves since most of our friends had flown home for the holiday while we could not, and not wanting to celebrate alone we decided to throw a Thanksgiving party and invite every poor soul we could find on campus who didn’t have anywhere else to go. I made some pies, a few side dishes, and a quadruple batch of my favorite pakoras; word spread, friends brought friends, and soon there were dozens of people and piles of food packed into our tiny living room. Not long after the party started a friend of ours showed up with a stranger in tow. He was a first-year student from India she apparently knew from one of her classes, and she had run into him on her way to our place. It only took one look at him to realize something was wrong, however; he was pale and edgy, said hardly anything and conspicuously avoided eye contact when we were introduced. I raised an eyebrow to the friend, who pulled me aside as soon as we had rejoined the party. "I’m sorry but I didn’t know what else to do with him. I found him on campus wandering around like a zombie, saying he had just been mugged at gunpoint. He’s spoken to the police, but I think he’s still in shock." Muggings like this were unfortunately far from rare occurances in New Orleans, but although reports of them were everywhere, this was my first time dealing with a recent victim of one. I looked helplessly at the poor guy, standing awkwardly in a corner of the room, when an idea came to me. I went to the buffet table, unearthed my bowl of pakoras and beckoned him over. I handed him one and said "maybe you know what these are?" His eyes grew wide as he took it. "Are these… pakoras?" he asked. I nodded and waited for him to try it, wondering if it would bear any resemblance to what he might have eaten in India. He tentatively took a bite, and then looked at me in amazement. "They taste exactly like at home!" He quickly wolfed down the remainder and eyed the bowl with glazed eyes. I smiled with relief and pushed it towards him, telling him to eat as many as he could fit in, before leaving him to tend to my pies. When I re-emerged from the kitchen, not only was the bowl of pakoras nearly empty, but our Indian guest was laughing and re-enacting his mugging in front of an enthralled audience. I can’t say for sure whether the pakoras had anything to do with his miraculous recovery, but I imagine that if someone offered me a bowl of good old macaroni and cheese after a traumatic experience in a foreign country I would certainly feel a lot better. 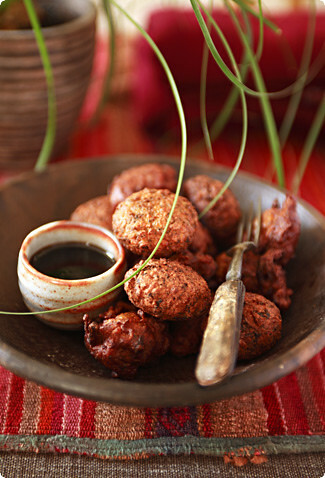 Of course, if there were pakoras around too, I just might opt for those instead. A specialty of the Parsi community in India, this recent discovery of mine has become one of my favorite pakoras. I love their perfect ratio of crunchy to soft, their complex flavors and hint of sweetness from both the bananas and caramelized onions. They’re perfect with just about any kind of chutney. Par-boil the potatoes in salted water for 5-7 minutes, then drain and cool. When cool enough to handle, grate coarsely. Heat the vegetable oil to 350F/175C in a large, heavy-bottomed pot and deep fry the sliced onion until golden brown and caramelized. Remove from the oil and drain on paper towels. Take the oil off the heat and reserve to fry the pakoras. Put the green chilies, coriander, garlic and 1/2 teaspoon salt in a blender or mini processor and blend to a rough paste. Mash the bananas in a medium bowl, stir in the grated potatoes, onion, and spice paste. In a separate bowl mix together the water, chickpea flour, tamarind, baking soda, turmeric and the remaining 1/2 teaspoon salt until smooth. Combine with the vegetable mixture and stir just until combined. Reheat the oil to 375F/190C. Deep-fry tablespoonfuls of the batter until brown, about 3-5 minutes. Serve immediately. or take the fast route and buy a block in Indian stores and many supermarkets. For the chutney, blend all ingredients in a blender or food processor until pureed. Combine the paneer, chaat masala and 1/2 cup (125ml) of the chutney (save the rest for dipping) and set aside to marinate for 1-2 hours at room temperature. Mix the remaining ingredients for the batter in a separate bowl until smooth, and stir into cheese mixture. If the mixture is too thick, stir in a couple more tablespoons water – it should be thick enough to hold its shape but not dry. Heat the oil to 375F/190C. With wet hands, form balls of the mixture and deep fry until golden brown. Serve immediately. This might just be my favorite chutney, with its perfect balance of sweet, salty and sour and its unbelievable ease of preparation. In all honesty, though, I should admit that I rarely measure the ingredients, instead tasting my way to the perfect balance of flavors, so feel free to adjust the quantities here. Also, I’ve made it with and without dates; if you choose not to use them just add a little extra sugar to compensate. Place the sugar, dates and water in a saucepan over medium heat. Bring to a boil and simmer for about 7-8 minutes, until the dates are very soft. Stir in the tamarind. Very carefully, pour the ingredients into a blender, clamp the lid down tight and blend until smooth (or blend in the pot with an immersion/stick blender). Return the mixture to the pot and boil until thick enough to thinly coat the back of a spoon (the chutney will thicken more as it cools). Stir in the spices and salt. Taste for seasoning: the chutney should be equal parts sweet, salty and sour. Add more tamarind, sugar or salt if any of these needs a boost. Store in a covered container in the refrigerator.